Making sure that good art remains expensive. I love Bar Codes and I never buy anything unless it has a Bar Code on it. 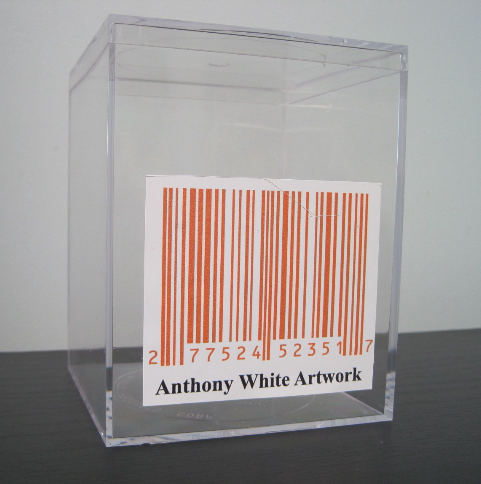 Only products with Bar Codes are worth buying. The plastic box is 4x4x5 inches in size and contains absolutely nothing. $US 199 each. Available in orange, blue, red and black. Who would have thought. I even disappoint myself. Art is all a lie. Just pick the lie you like the most. When I sell one of the painting for the $AU1/ �1/$US1/�1 amount on the canvas I then work on selling the next painting in the series (last painting + 1). I only sell them in numeric order and for the amount painted on the canvas.